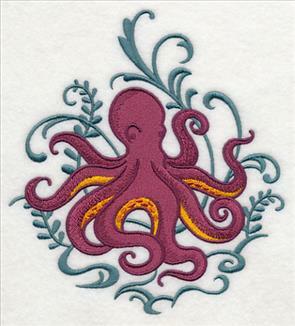 Ideas from creative stitchers like you are featured today in an all new Request-fest! Suggestions for designs pour in from all over the world, with a selection highlighted here for your stitching pleasure. Graceful wings highlighted by charcoal flourish backdrops create a unique and elegant look in Baroque Butterflies in Flight. 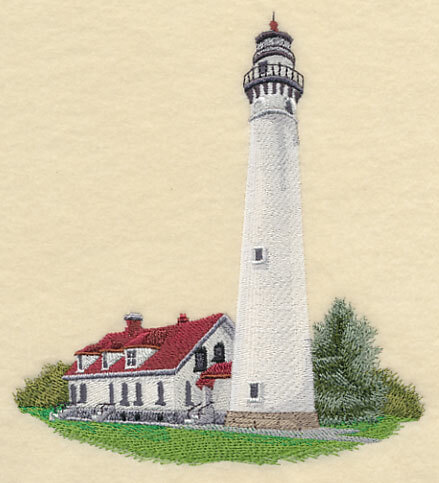 Brilliant roses and azaleas, historic lighthouses, sea life echoes, new animal sketches, and much more are ready to add color and style to your projects. Enjoy the fabulous variety -- and save! 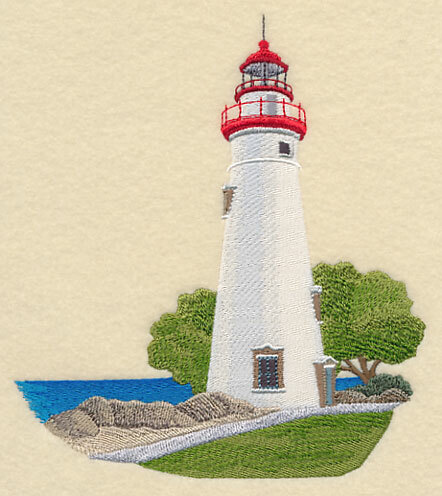 Creative new designs inspired by customer requests add style and flair to summer stitching! 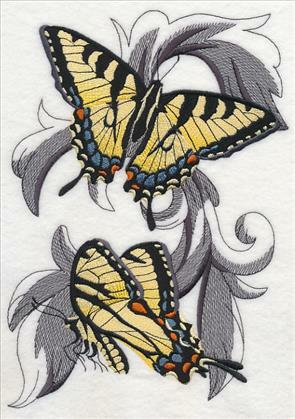 Rita loved the Monarch Butterflies in Flight and requested additional butterflies in the same style. Baroque flourishes in charcoal highlight the stunning natural color of the butterflies' wings for an eye-catching contrasting effect. 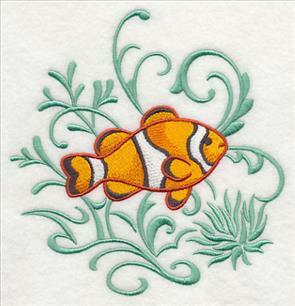 Stitch a delicate and delightful focal point onto quilts, tote bags, pillow covers, wall hangings, towels, and more! 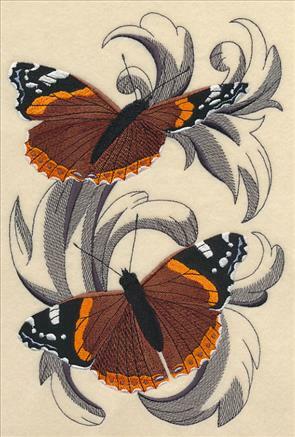 Below, the gorgeous hues of the Tiger Swallowtail and Red Admiral are perfect for summer projects. 6.89" x 10.12" and 5.86" x 8.61" and 5.29" x 7.78" and 4.66" x 6.85"
The Buckeye must fool predators with all the "eyes" on their wings -- which end is up? How many butterflies are there on that flower? At right, a butterfly with the excellent name of Question Mark shows off orange and russet tones. Ethereal and lovely on nature quilts. 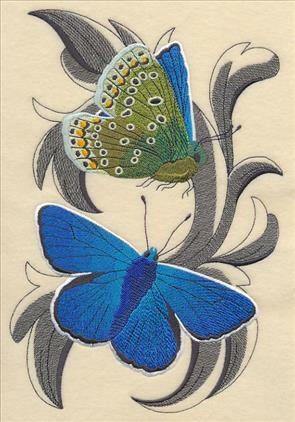 6.88" x 9.86" and 5.85" x 8.38" and 5.42" x 7.77" and 4.78" x 6.85"
The Common Blue butterfly is anything but common, with jewel-toned blue outer wings and subtle sage, teal, and yellow on the under part of the wings. So lovely! On the right, Clouded Sulfurs are a vision in yellow and black. Fabulous on a set of toss pillows! 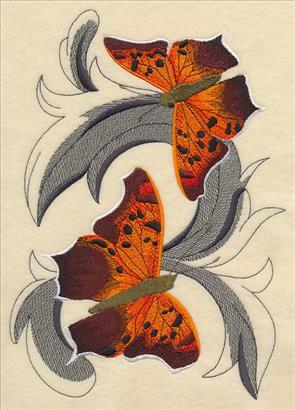 6.88" x 9.88" and 5.85" x 8.40" and 5.42" x 7.78" and 4.77" x 6.85"
Baroque butterflies in flight bring rare beauty to pillow covers, wall hangings, quilts, tote bags, table linens, towels, and more! 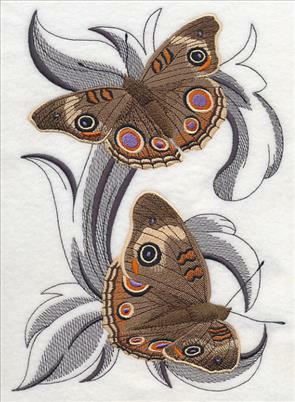 Charcoal baroque backdrops make the butterfly wings pop with color on embroidery projects. Order the designs individually by clicking the links above, or get the pack with all 6 designs. Four sizes are available to suit any project. Click on a link below to see the designs in the pack, and add the pack to your cart. 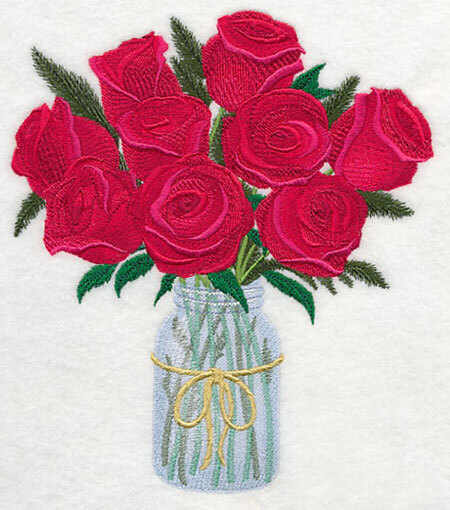 Carolyn requested roses to join the Mason jar bouquet collection. Superb color makes petals seem almost life-like as they bloom from a rustic Mason jar. 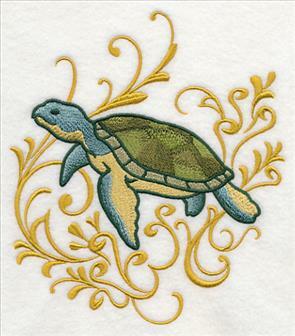 Gorgeous on pillow covers, quilts, wall hangings, and as framed wall art. 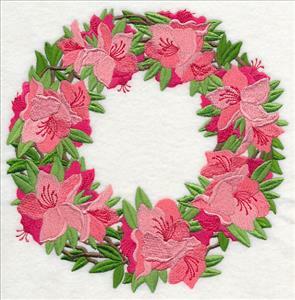 6.83" x 7.78" and 5.83" x 6.64" and 4.88" x 5.56"
A wreath and a bouquet show off azalea's delicate blossoms and fresh leaves, in designs requested by Shelley. 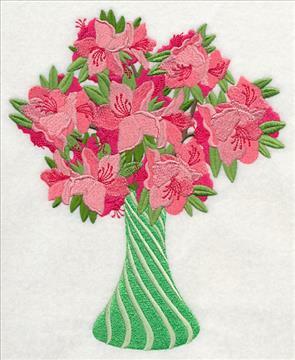 Let them bloom on pillow shams, wall hangings, quilts, and more for long-lasting summer beauty! 6.90" x 8.42" and 6.39" x 7.80" and 5.86" x 7.15" and 4.88" x 5.95"
Located at the north end of Racine Harbor in Wisconsin, the Wind Point Lighthouse is one of the oldest and tallest still operating on Lake Michigan. The lighthouse was built in 1880, and the signals from the huge fog horns could be heard 10 miles out into the lake. 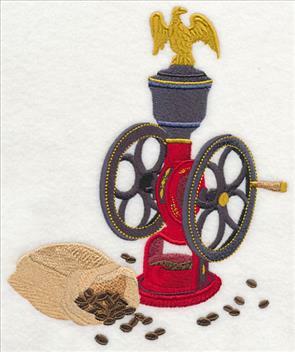 Add this impressive light to pillow covers, quilts, and wall hangings for a bit of maritime history. Thank you, Carla, for the bright idea! 5.89" x 6.30" and 4.84" x 5.23" and 3.56" x 3.85"
Marblehead Lighthouse in Marblehead, Ohio, is the oldest lighthouse in continuous operation on the United States side of the Great Lakes. It is one of Lake Erie's best known and most-photographed landmarks. 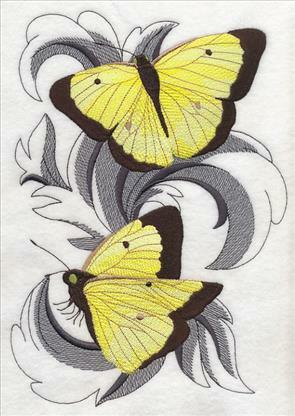 And now, thanks to Debby's request, it is a distinctive embroidery design as well! 5.85" x 6.47" and 4.85" x 5.37" and 3.48" x 3.85"
Sea life echoes feature marine creatures highlighted by flowing filigree reminiscent of rolling waves. 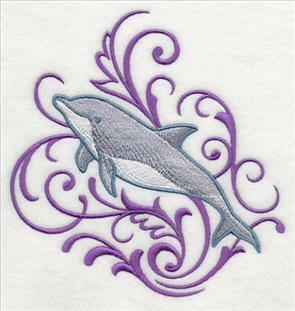 Requested by Karen, these "echo" designs bring ocean-fresh fashion to beach cover-ups, towels, bags, pillow covers, and shirts. Below, an orca and a dolphin swim with speed, power, and grace. Impressive on sea-themed quilts and wall hangings! 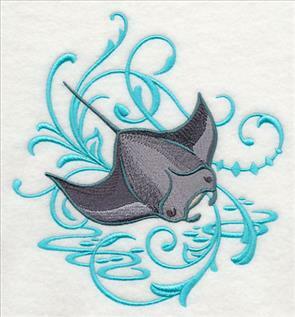 5.84" x 5.99" and 4.83" x 4.95" and 3.78" x 3.88"
A manta ray is a quicksilver silhouette among the waves, and a great white shark swims silently through the ocean depths. 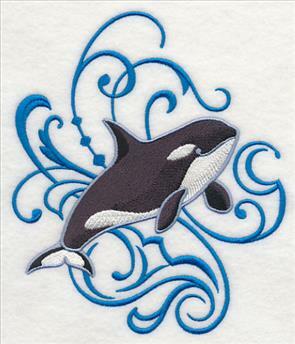 Ideal on summer shirts and light jackets, as well as beach towels and totes. 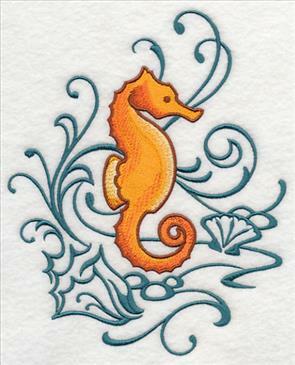 5.81" x 6.53" and 4.81" x 5.40" and 3.46" x 3.88"
Flowing currents gently carry a seahorse and a sea turtle. Create colorful quilts and wall hangings with these unique designs. 5.82" x 6.59" and 4.78" x 5.41" and 3.42" x 3.87"
A clown fish pauses among the anemone, and an octopus waves his tentacles in the water. 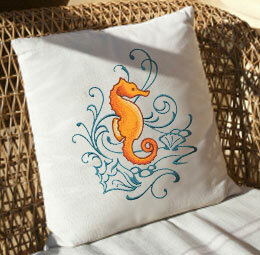 Add a nautical look to beachwear, towels, and totes with these fresh designs! 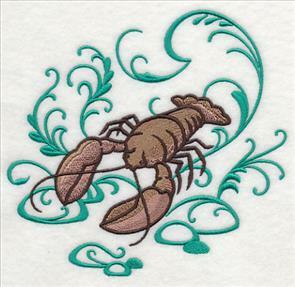 5.82" x 6.36" and 4.81" x 5.26" and 3.53" x 3.87"
A lobster crawls along the ocean floor, ready to spruce up aprons and towels in a snap. 6.10" x 5.82" and 5.03" x 4.80" and 3.88" x 3.70"
Net all these fresh marine creatures with the Sea Life Echoes Design Packs -- and get the best price! Dress up projects for the beach and the pool as well as home decor with an orca, a dolphin, a clown fish, a lobster, and more. Order the designs individually by clicking the links above, or get the pack with all 9 designs. Three sizes are available to suit any project. 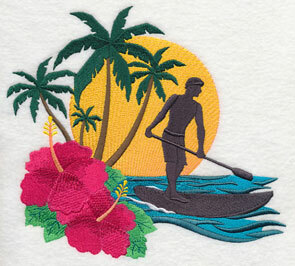 Paddleboarding has been an ocean sport since the first boards were constructed in the early 1930's. Today, stand up paddleboarding is exploding in popularity. 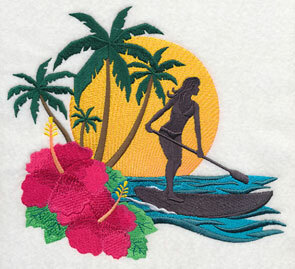 Kathy requested designs showing paddleboarders silhouetted by the sun, enjoying amazing ocean views from horizon to horizon. Add a tropical touch to towels, totes, and cover-ups! 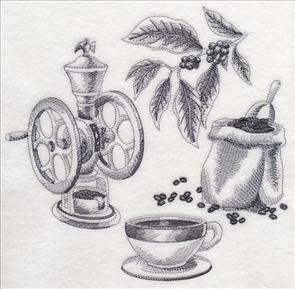 7.69" x 6.90" and 6.52" x 5.85" and 5.39" x 4.83"
Perk up towels, wall hangings, tote bags, and more with classic Elgin coffee mills. Thanks to Linda's request, they're the perfect recipe to brew up projects with a savory cosmopolitan look. 7.80" x 7.56" and 7.12" x 6.90" and 6.02" x 5.85" and 5.00" x 4.86"
Bobcats have been in existence for around 1.8 million years. These wild cats live in wooded areas as well as semidesert, urban edge, forest fringe, and swampland environments. 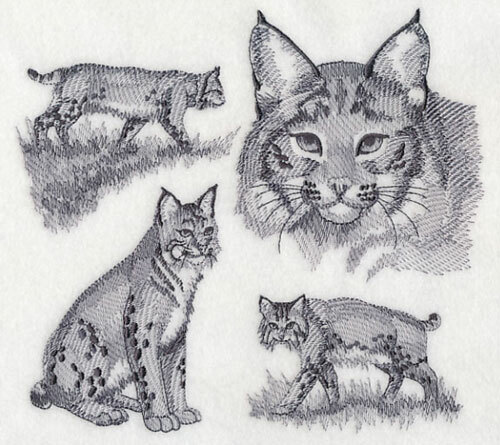 Let this gorgeous bobcat medley, requested by Doris, find a home on your next embroidery project. 7.54" x 6.90" and 6.46" x 5.86" and 5.33" x 4.86"
Doris wanted to see the delicate yet strong features of the pronghorn rendered in a sketchbook style. 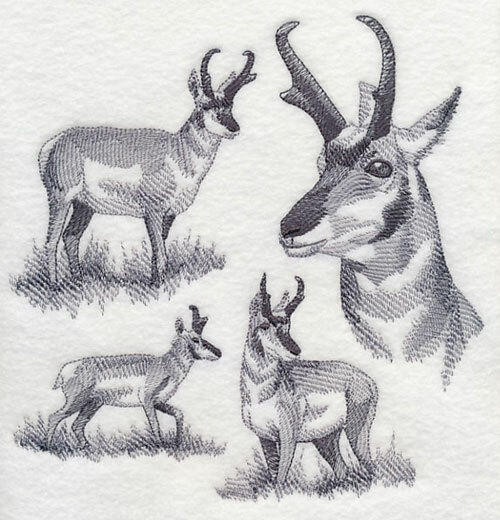 Stitch this fast antelope -- and design -- onto bags, wall hangings, jacket backs, and more for an impressively sleek look. 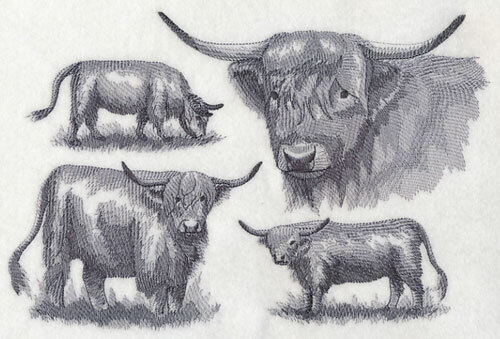 7.65" x 7.80" and 6.90" x 7.04" and 5.85" x 6.01" and 4.85" x 4.95"
Highland cattle show off their distinctive shaggy coats and massive horns in a sketched medley requested by Helen. Originally bred in the Scottish Highlands and Western Isles, breeding stock has been exported to the rest of the world, especially Australia and North America, since the early 20th century. 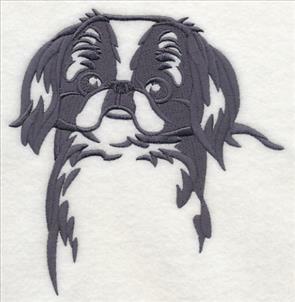 A handsome design for embroidery projects of all kinds! 10.34" x 6.90" and 8.76" x 5.84" and 7.80" x 5.21" and 6.86" x 4.59"
And there's one more request! 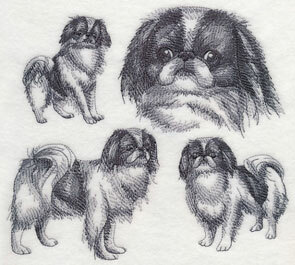 Jean suggested the Japanese Chin, a dog of Japanese royalty with an irresistibly cute face. Chins are one of the most "cat-like" of dog breeds: alert, independent, and fond of perching in high places like the backs of sofas and chairs. They even use their paws to wipe and wash their faces! These sweet dogs will bark to alert a visitor but otherwise are very quiet. 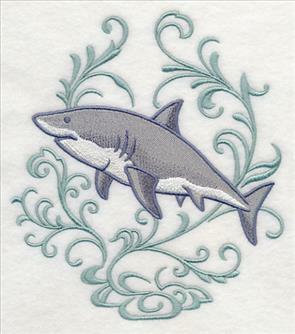 Stitch onto tote bags, quilts, pillow shams, and more for a cute and lively look. Thank you, Jean, for your request! 5.85" x 6.01" and 4.84" x 4.97" and 3.75" x 3.86"
We are always excited to hear your suggestions for new designs -- Request-fest can't happen without your inspiration! Thanks to all who sent in ideas for new designs. Are you wondering how to request a design? Send an email with your design suggestion to us at support@emblibrary.com.